US Supreme Court Justice Sonia Sotomayor, the third woman and the first Hispanic appointed to the Court, spent an hour discussing her new book and answering questions from law students in the Merhige Moot Courtroom at the University of Richmond November 18. Dean Wendy Perdue’s wry response: “It worked out OK,” brought laughter from the students and the faculty, who filled the courtroom and overflowed into adjoining rooms where the event was live-streamed. 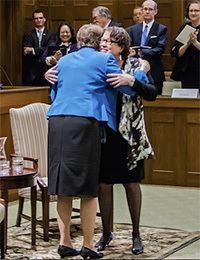 Sotomayor focused extensively on human issues, including empathy, giving back, the importance of making real connections with classmates and friends, and sensitivity to the feelings of others in the courtroom, to which she referenced Safford Unified School District v. Redding, where the court found the strip search of a 13-year-old girl unconstitutional. Responding to a question as to what advice she would give to children who are growing up underprivileged, Sotomayor stressed the importance of appreciating all accomplishments, no matter how small, and of each person defining their success in their own terms. She pointed out that her initial salary as a district attorney was $17,500 a year, far less than many of her law school friends were making as private attorneys. Yet she reminded herself that this was far more money than her own mother, a nurse, had ever made.